KIM LAWTON, correspondent: At Miami International Airport this week, Cili Dubersaint anxiously awaited the arrival of her sister, an earthquake victim who had part of her leg amputated. 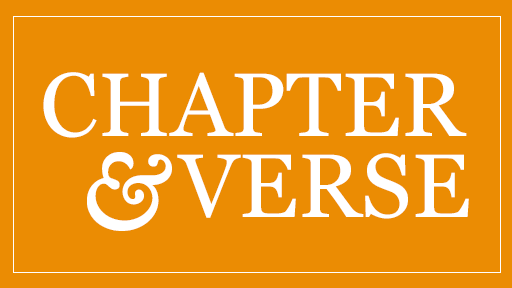 On the same flight, a team from the Lutheran Church Missouri Synod (LCMS) returned to the US after doing emergency relief assessments and providing medical and spiritual support in both Haiti and the Dominican Republic. Even the veterans among them were still reeling from the horror they had all just left behind. REV. GLENN MERRITT (LCMS World Relief and Human Care): I’m experienced as a disaster responder and a first responder and also as a canine responder, and the things that I saw were almost unimaginable. LAWTON: American faith-based groups continue to play an active role in getting emergency help into Haiti. They say while the situation remains chaotic, more food, water, and medical attention are making it to the people in need. For the next six to eight weeks, the Lutheran Church Missouri Synod will be sending regular shipments to feeding centers being set up in Haitian churches. The logistical obstacles remain immense. MERRITT: It’s often, in Dominican Republic, easy to find the food to go into Haiti, but it’s difficult to find a way to get it in there and that’s the challenge, and of course fuel is in short supply, too, so if you’re running a truck to Port au Prince you need to know that you can get the fuel to come back out again. LAWTON: In addition to providing food, water, and medicine, relief officials are now moving from the immediate emergency response to more long-term recovery planning. This week, Samaritan’s Purse, the humanitarian group led by evangelist Franklin Graham, sent a barge to Haiti loaded with 400 tons of machinery that was too heavy to fly in. 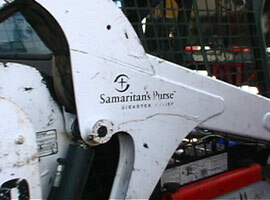 LUTHER HARRISON (Samaritan’s Purse): They need other equipment to continue their work as they’re coming out of the emergency phase and into the recovery phase. You can see we have everything—heavy equipment, dump trucks, bull dozers, excavators, skid steer loaders, things that we can get in and help start cleaning up this debris. LAWTON: The group is also shipping in supplies for water purification and materials for building shelters. They say providing practical help is part of their religious mission. HARRISON: No red tape. Show them the love of Jesus Christ as we go out and try to help them get back on their feet. LAWTON: Notre Dame D’Haiti Catholic Church in Miami’s Little Haiti neighborhood is coordinating the Archdiocese of Miami’s response. Every day, volunteers sort and pack the donations that keep pouring in. Father Reginald Jean-Mary is also developing more long-range plans. REV. REGINALD JEAN-MARY (Notre Dame d’Haiti Catholic Church): In the next two months, the next three months, I think we need to start restoring the economy of the country to give people the sense of autonomy, the sense of dignity, and also I see a great need of trying to begin establishing structures that’s going to help the people in the future. LAWTON: Father Reginald and other faith-based groups are also focusing efforts on helping Haitians here in the US—those who’ve recently arrived after surviving the earthquake and those who have been here and now can’t go back. The US government has announced a new program that will allow undocumented Haitians who were living in the US, or those who were visiting here when the earthquake hit, to apply for Temporary Protected Status or TPS. That means they would be able to legally live and work here for the next 18 months. The US Office of Citizenship and Immigration Services expects up to 200,000 Haitians to apply for TPS. OSCAR RIVERA (Church World Service): Right now, the way the situation is in Haiti, it would be inhumane to send them back, so this is something very good that our government has done to be able to keep these folks here and assist them. LAWTON: Oscar Rivera directs the Miami office of the ecumenical Christian group Church World Service (CWS). CWS has a long history of refugee assistance and has already begun a nationwide project helping Haitians wade through the regulations and fill out the paperwork to apply for TPS. 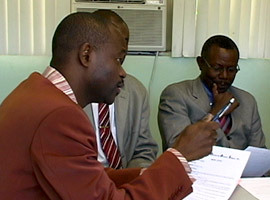 The group is also offering legal advice to Haitian families with differing immigration statuses. NANCY DENIS (Managing Attorney, Church World Service): This is a catastrophe of really epic proportions, and it’s going to take a kind of a comprehensive approach to deal with the various situations that people are being faced with. LAWTON: And CWS is helping the Haitians who came here with family members who were seriously injured in the earthquake and medevacked to US hospitals. In all of these projects, the group is working with a network of affiliated local churches. RIVERA: The churches are a key part that, with their help, with their time, with their donation, with their expertise that they have greatly helps us with making a difference in these peoples’ lives. LAWTON: Reverend Joanem Floreal of Miami’s Shalom Community United Methodist Church says working within the churches builds community trust. REV. JOANEM FLOREAL (Shalom Community United Methodist Church): As pastors, we are trusted voices. As men of God, as women of God, people really trust us. LAWTON: Floreal is part of a South Florida pastors’ group that has come together to address the many dimensions of the crisis—comforting the grieving in their congregations here and strategizing about how to provide more aid to Haiti. FLOREAL: There is a sense of solidarity. There is a sense of unity I have never experienced before. We have Baptist pastors, Pentecostal pastors, United Methodist pastors, Free Methodist pastors, nondenominational pastors, pastors across denominational lines getting together to help people in Haiti. This is a great thing. This is something for us to celebrate. LAWTON: Reverend Matthew Harrison, director of the Lutheran Church Missouri Synod’s World Relief and Human Care, says he found cause to celebrate in the strength of the Haitian people. 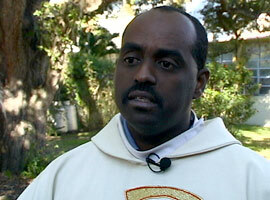 He just returned from providing pastoral care to Haitian refugees at a Dominican Republic hospital. REV. MATTHEW HARRISON (LCMS World Relief and Human Care): The strength of the people just absolutely impressed everybody—a woman who just had her arm guillotined with nothing but Tylenol being treated by our doctors, smiling and thanking them for the love. It was an experience that was just overwhelming for our people. 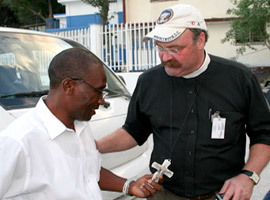 LAWTON: He believes spiritual and emotional counseling will be a necessary part of Haiti’s future. HARRISON: It’s going to be very important for all the religious community in the United States to come along with their faith communities, their denominational partners in Haiti and walk together with them, but especially to realize the strength is there. The strength of the future is in Haiti, not the United States, and the answers to their future are there, not here. LAWTON: At Notre Dame d’Haiti, Father Reginald says he and his congregation are exhausted by the trauma of the last two weeks. But, he says, he’s still preaching hope. JEAN-MARY: It is not a time for them to continue mourning and crying. This is the time to lift up your head, look in the sunrise direction, because the light of God is not off in Haiti. The hope will continue to burn and to shine. Therefore keep your head up, keep your dignity, and continue to strive to stay alive, because once you lose it, you lose it all. LAWTON: He says sustaining that hope is the only way to Haiti’s ultimate recovery. I’m Kim Lawton in Miami. "In Haiti There Is Anguish"